When you have to teach clothes vocabulary, do you always use flashcards and illustrations? Why not give your students the real deal? Clothing items supply plenty of opportunities for kinesthetic activities with young learners, and if you use them with adult learners – they’ll certainly be surprised! Try to have a bag with an assortment of clothes ready for lessons in which you’ll talk about clothes. For little ones, a trunk full of clothes in the corner of the classroom guarantees instant fun. This is the perfect way to practice, “I’m wearing….”. Students choose three items to wear from your trunk or bag and take turns modeling them. Why practice clothes shopping role plays with imaginary clothes, when it’s so much better to use real ones? First, prepare the items by giving each a price tag – you can have this ready beforehand, or ask your students to help you. Students take turns buying and selling items. For extended practice, expand the role play to include the fitting room conversation: The jacket fits/doesn’t fit. It’s too long/short. Could I have a smaller/bigger size? Young learners can be very dramatic, and they love to dress up! Have your own little class play and provide them with the clothes to wear. You can put on a play or show for another class or your students’ parents. Lay several items of clothing and accessories on a table. Give your students commands like, “Put on the red scarf”. Make it more challenging and test their listening skills by having similar items of different colors: “Put on the scarf with green and blue stripes”. Ask one student to put on several items at the same time for a fun, ridiculous look that will make your students laugh. Practice prepositions of place. Arrange several clothing items around the classroom which will be your “shop”. Drape a sweater over a chair. Put a scarf under a desk, and so on. Ask your students, your “shop clerks” to take a long hard look at the classroom and try to remember where everything is. Ask a student to step out of the classroom. Take two or three items and hide them. Ask the student to come back and say there has been a robbery. They must report what was stolen from the “shop”: There was a green sweater on the chair and a red scarf under the desk. Clothes are great items with which to practice demonstrative pronouns. You’ll need several similar items like several pairs of socks and shoes, plus scarves, belts, shirts, skirts, etc… Place a scarf close to students and one further away. Say, “This scarf is blue and that scarf is red”. Do the same with pairs of socks for these and those. Place a suitcase full of clothes in front of your students. You can do two things. You can either have them sort them into what is more appropriate for each season, or you may also describe some weather conditions and have students choose what they should wear: “It’s cloudy and windy. It’s about 75 degrees.” Students should choose items that are appropriate for rainy weather. If you want to give your students clothes worksheets to continue practicing, you’ll find over 80 worksheets you need in our clothes section. Real items and props allow students to use several of their senses at once. Moreover, all students can easily relate to clothes. Because it may result bulky, to bring in piles of clothes to the classroom, try bringing a few at a time and store them in your classroom. 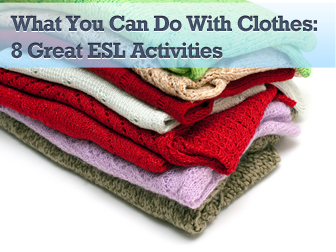 Before you know it, you’ll have a great collection of clothes for your students to play with! If you want to more ideas on ways to use different objects like a cell phone, a ball, or a blindfold, be sure to check out our fabulous ESL Essentials section. Your ESL activities will never be the same!